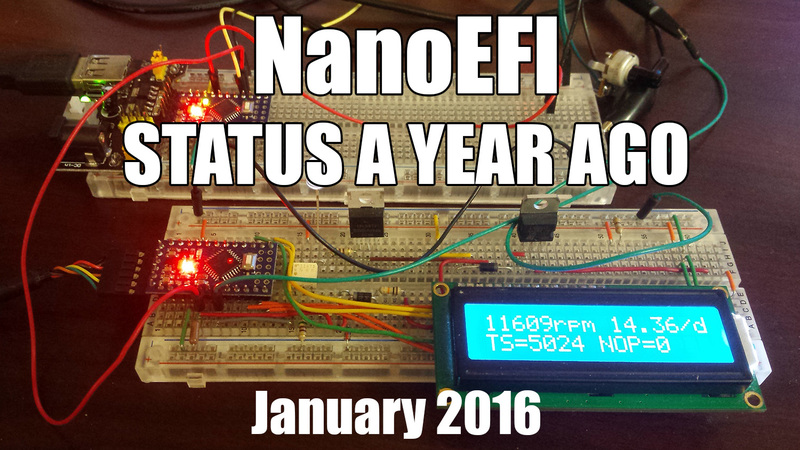 At the beginning of 2016, NanoEFI was just a concept in very early testing. Since then, part-time (yet intense while active) development has brought NanoEFI a long way. It’s been a unique learning experience and I thoroughly enjoy the work. A big thank you to everyone who has shown interest, and to everyone sending me messages wanting a kit right now! Carving off the time necessary to post updates is always difficult, so I’ll cover as much ground with this series of updates as possible. What happened to the Fall Beta release? Although very far along, the development just isn’t ready yet. I’ve decided that it’s’ best to extend the pre-alpha and alpha stages. I’d rather release later, than release too early and skimp on quality. A few stubborn hardware problems are holding up software development right now. The newest changes to hardware accounts for only 2% of the progress bar, but reflects a big redesign and shift in overall direction. 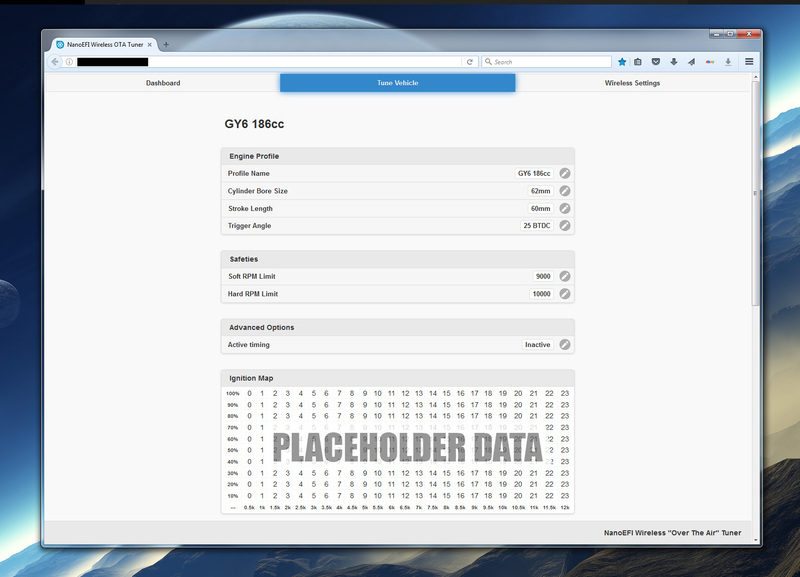 My last update covered v0.1.2 – whoa, that was five iterations ago! These new boards have just arrived, and are waiting for assembly and reflow. Until v0.1.6, headers for the Arduino Mini were being used for development. This became an encumbrance to progress of the design and had to go. Dropping the Arduino board clears room for future development of an often requested set of features. Although I’m moving in a direction that would accommodate these features, right now these aren’t immediate objectives. Top priority is getting development to the point of being ready for production of beta units, and making kits available with the current official features enumerated on the home page. Keep in mind, we’re still in the pre-alpha stage right now. The ATMEGA is capable of operating at 20mhz, whereas Arduino boards are limited to a slower 16mhz. This upgrade should give us the bump in performance necessary to support vehicles that run higher engine speeds (past 12,000rpm) and across a wider temperature range than what would otherwise be possible. Not to mention the more precise and reliable characteristics of a real crystal over a resonator. 3… 2… 1… We Have Ignition! Testing the new ignition system blew away my expectations, and was a lot of fun. 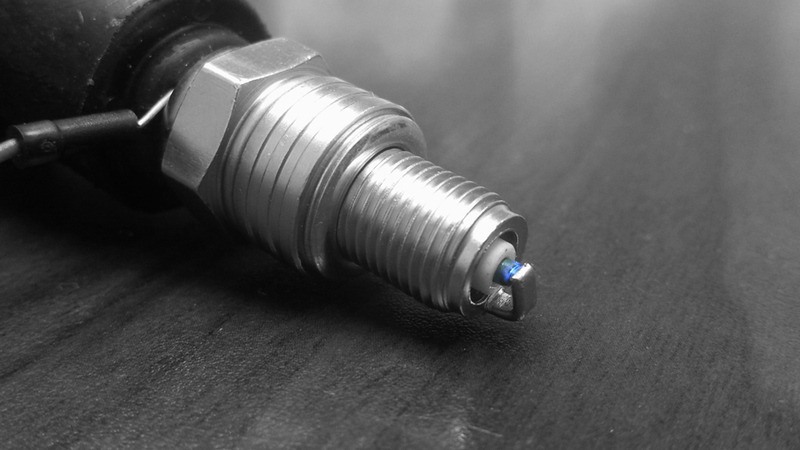 On the bench, the new hardware tested able to drive stable spark to 30,000rpm. Wow, no performance bottleneck there! The ceiling of 30k shows great potential to optimize firmware (streamlining calculation and communication routines) for higher maximum redline of the system later. 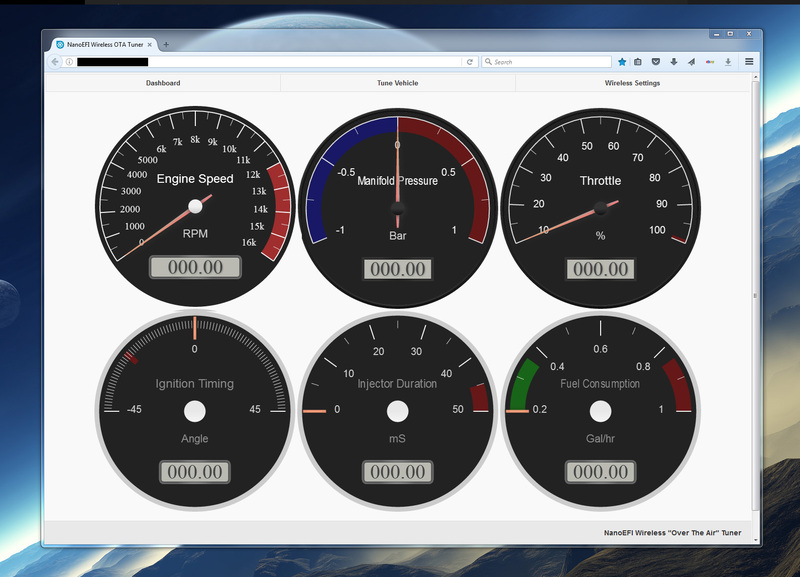 I’m very excited about the new Mobile Dashboard, it will transform any mobile or desktop device into a functional automotive gauge set. Originally this feature was named the “live view” with very limited functionality, intended for diagnostics with slow update speeds. Fortunately with the improvements to the ESP libraries over the last year, it appears that we’ll have a fully featured real-time dashboard! The Wireless OTA Tuner has been really shaping up in development. In case you missed previous updates, NanoEFI has its own specialized on-board wireless tuner. Aftermarket EFI kits typically force you to carry around a laptop in order to tune your machine. If you’re lucky, some will produce a (clumsy) Bluetooth adapter for their system, and gladly charge you more for the option. 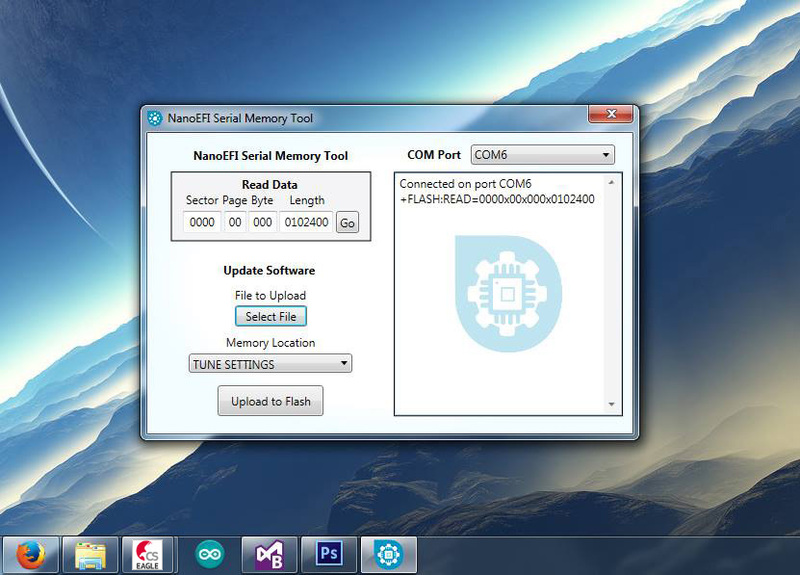 NanoEFI natively creates a local hotspot, and connects easily in your internet browser on any mobile, tablet, or desktop machine for tuning. This is great, because everyone has a modern browser in their pocket these days. Not to mention the benefits of using the robust TCP/IP protocol. If you use Firefox or Chrome, you already have everything you need to tune NanoEFI! No special hardware, adapters, or other such hassles. The focus of the Tuner program design is to be clean and intuitive, so you don’t need to spend days learning how to use it. 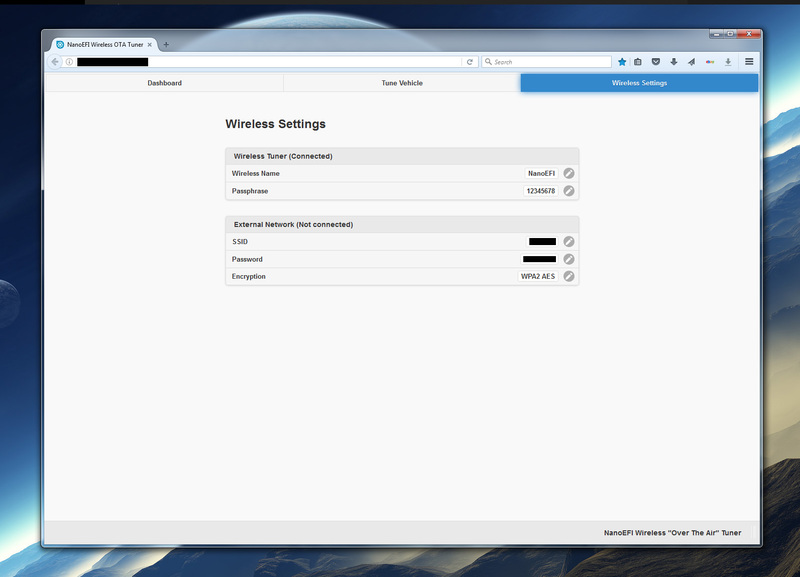 Managing the Mobile Tuner Hotspot (WiFi) and external LAN connection is done through the Wireless Settings tab. Security lockout – suspend operation to prevent unauthorized starting. There will be much more on this later. Remember when I mentioned the need for extra memory at the bottom of this update? To make the On-Board EFI Tuner work, megabytes of software and profile data has to be stored somewhere. Due to limited memory size, storing this information isn’t possible on the ATMEGA. I determined that the 32megabit Spansion NOR Flash chip was the best solution. Essentially, a “hard drive” for the Tuner’s on-board server. Development of this memory setup was a big success, and worked very reliably. I developed streaming functions for using the ATMEGA as a communication bridge, between the computer’s serial COM port (UART) and SPI flash. After achieving decent transfer speeds, I started building a new Flash file system from scratch. Even wrote a Windows application for easily burning the Tuner software and profile data to different areas of memory, which sped up development greatly. 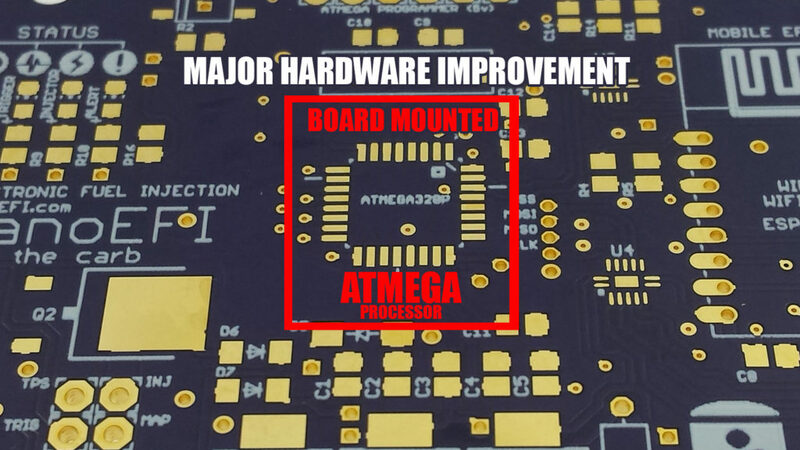 Yet the landing pads for the memory device are absent in the picture above of the v0.1.7 board. If it worked so well, what happened? All of that work was scrapped in the end. Thanks to a little oversight in my initial homework, I was unaware that newer ESP8266 libraries already have this functionality, and the ESP has more than enough memory for data storage on board. Oops. I really wanted to use that dedicated external memory, and spent a lot of time getting it right. 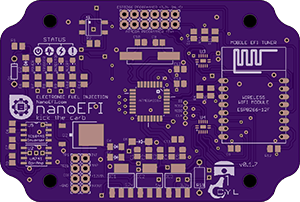 However, rule #1 of NanoEFI is ultra low cost. The extra $0.68 price tag on each (now redundant) flash chip meant that it had to be phased out. These things happen. What’s important is that we’ve pivoted and will continue moving in the right direction! 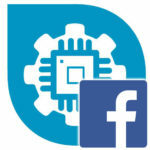 The best way to encourage me write more frequent updates is to like, share and comment on the NanoEFI Facebook page. Wow This is great. I am sure you know many people are excited about this especially since i read somewhere this is Open Source. If you need any help developing code let me know. I just moved to Spain from Silicon Vally, bought a keeway superlight that would work perfectly as a test subject and also I have plenty of time on my hands. I belong to several Kawasaki Triple motorcycle forums and there are literally a hundred or more guys who would be willing to buy an EFI for our bikes. So a recommendation would be to add a 3 cylinder setup to your list! We already have a very good CDI and access to an aftermarket ignition controller with maps but really need a “modern” fuel system and Indirect EFI is it. Direct Injection has too many issues for air cooled 2 strokes. Rick triple seems to be out of scope for this project, you may want to look at speeduino for the Triple motorcycles. This looks very promising, and fits the bill of a future project of 1990s motorbike to efi. I’d be happy to help in any way that I can. I’d pay for a early version. Is the intention of this project to sell a complete ‘kit’ for converting a carb engine to EFI, or only provide the electronic control system? I would love to see this work on 6v bikes as well. I have a Harley Davidson Sprint 250 that I have been playing around with. In perfect shape they are worth $5000 at the most, so I customize it the way I want and is still a 66 Harley. The Honda NX650 would be the proud recipient of this well thought out development. With much encouragement, because all too often, online plans such as this end up as vaporware 🙁 boo! I would love to be included in an early purchase of this fine NanoEFI hardware. Documenting my setup adventures into a tutorial, or user guide is how I’d like to contribute to this amazing project. I’ve got experience creating documentation, and some formal credentials if you are interested. Keep up the AWESOME development work, have fun, and know that we want to help this project, whos time has come, achieve full success! Sir, this will be a game changer for me for sure. I work for an E-Z-GO dealer and get asked all the time the cost of retrofitting the engines to efi. The look of pain on their face is unbearable. I will for sure test a kit when it becomes available. Suggestion for future is 1 BAR OR 2 BAR MAP sensor capability for adding turbo or supercharger. I’m following development. I have several lawnmowers and small tractors that would benefit greatly from nanoefi. Any time frame on release? Any updates at all? What are your bottlenecks? Anyway I can help?